CashBag Rewards is an exciting new rewards program where you earn cash back when shopping online. Now isn’t that exciting news? If you enjoy using the Snap ‘n’ Save app to get cash back on your grocery purchases, you’re going to love using CashBag Rewards to get cash back when shopping online as well! 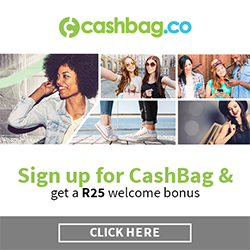 CashBag has partnered with selected South African online retailers such as Spree, Travelstart, Faithful to Nature, Zando, Mantality, NetFlorist, Wantitall, Sweep South, Homechoice, and more, to give you up to 25% cash back on your online purchases. While I don’t often shop online, I have at times bought from a few of those retailers. Now I wish I had known about CashBag Rewards sooner! Every bit of cash back counts. So how does CashBag Rewards work? Well, first, you do have to sign up and you can do that by clicking the link below. You will automatically receive a R25 welcome bonus too. Once you are registered on the CashBag Rewards website, you can begin your online shopping. You will find the latest discounts, e.g. R50 OFF, or the cash back percentage offered at selected online retailers, on the CashBag Rewards homepage. Always begin your online shopping from the CashBag Rewards homepage by clicking on a selected retailer. This will ensure that your cash back rewards are applied to your purchase, and you will be re-directed to your selected retailer to browse and shop. Your discount, or cash back percentage, will then be applied to your online shopping, provided you’ve followed the link from the CashBag Rewards site and completed a purchase. 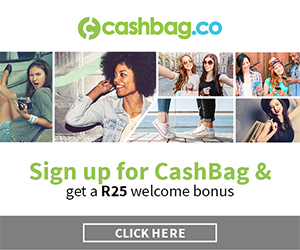 Alternatively, you can opt to download and install the CashBag Rewards button for your browser, and receive a R25 bonus just by doing that. The CashBag button will then notify you when you visit a CashBag partner site so that you never miss out on an opportunity to earn back some cash. Or even better, why not download the CashBag app for your smart phone? If your cash back balance is less than R100.00 then the balance will be carried over to the next quarter. For more information on CashBag Rewards check out their FAQs. 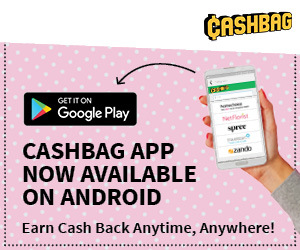 If you’re happy to earn cash back with CashBag Rewards, remember to spread the word and refer your friends to sign up! 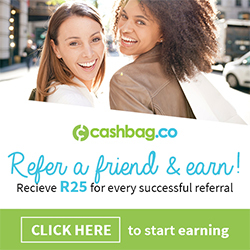 For each successful referral, you will receive R25 in your CashBag account and your friend will receive a R25 welcome bonus too! Disclaimer: Financial compensation was not received for this post. However, I may receive a small referral fee if you decide to sign up for CashBag Rewards by following the sign-up links displayed in this post, and on my blog.